After Peter and Jesus were in the boat, the wind became calm. Then those followers in the boat worshiped Jesus and said, "Truly you are the Son of God." The ultimate goal of experiencing Jesus' presence and power in our lives is to lead to our praise of him for who he is and what he has done. Rather than simply an adrenaline fix, an emotional wave, or an incredible experience, our service to Jesus and our recognition that his presence and power make us better than we really are should lead us to praise him and confess him as God's Son and our Savior. Holy Father and eternal King, thank you for your plan to send Jesus, you Son. I believe that Jesus Christ is your Son who came in the flesh and redeemed me from my sin by being my atoning sacrifice. I love you for loving me so sacrificially and cleansing me so purely. 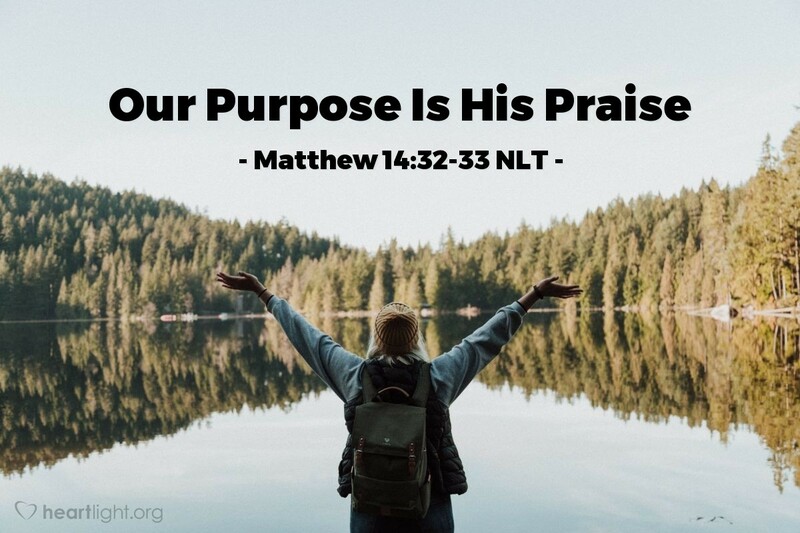 I praise you for Jesus and I praise Jesus because he is worthy of all praise, honor, and obedience. In the name of Jesus my Savior, I offer my eternal thanks and praise. Amen.